Grain composition plays a vital role in impact pressure of debris flow. Current approaches treat debris flow as uniform fluid and almost ignore its granular effects. A series of flume experiments have been carried out to explore the granular influence on the impact process of debris flow by using a contact surface pressure gauge sensor (Tactilus®, produced by Sensor Products LLC). It is found that the maximum impact pressure for debris flow of low density fluctuates drastically with a long duration time while the fluctuation for flow of high density is short in time, respectively presenting logarithmic and linear form in longitudinal attenuation. This can be ascribed to the turbulence effect in the former and grain collisions and grain-fluid interaction in the latter. The horizontal distribution of the impact pressure can be considered as the equivalent distribution. For engineering purposes, the longitudinal distribution of the pressure can be generalized to a triangular distribution, from which a new impact method considering granular effects is proposed. 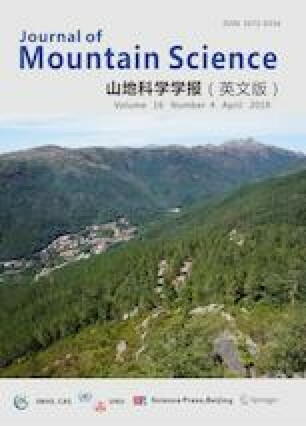 This work was funded by the Research on Prevention and Control Technology of Ecological Debris Flow Disasters from Department of Land and Resources of Sichuan Province (Grant No. KJ-2018-24); the Natural Science Foundation of China (Grant No. 41772343); the Chinese Academy of Sciences and Organization Department of Sichuan Provincial Party Committee “Light of West China” Program (the key control techniques of glacial debris flow along the Sichuan-Tibet Railway), the Key International S&T Cooperation Projects (Grant No. 2016YFE0122400) and the Natural Science Foundation of China (Grant No. 41471011).